Mark Vincent is WBIS—Washington Bureau of Intelligence and Security. Quinton Mann is staunchly CIA. Mark thinks the CIA is full of dilettantes who leave him and the rest of the WBIS to clean up their messes. Quinn thinks most WBIS agents are sociopathic loose cannons. So they don’t exactly get along. Of course, just because they don’t like each other doesn’t mean they can’t play mind games on each other. Or sleep together. But when an explosion at Mark’s apartment sends Quinn to the morgue to ID a body, he has to reevaluate his position on denial. 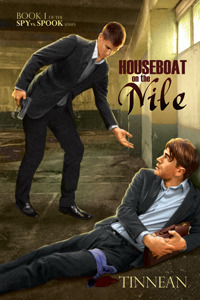 When the term “Nile” appears in the title of a book, as it does in Houseboat on Nile, by Tinnean [Dreamspinner Press, 2012], one immediately thinks of exotic places à-la-Agatha Christie and Hercule Poirot, etc. That was the first query I encountered with this story. It actually doesn’t have anything to do with the Nile. But, then again, the story blurb never said it did. It’s a cloak-and-dagger-type mystery, written in a style that is reminiscent of Mickey Spillane—take away the 21st-century swearing. The characters are interesting, fairly well developed I’d say from the perspective of being distinct from one another, and the dialogue (although made repetitious more times than enough) is crisp and effective. The basic plot has two men who dislike each other professionally, romantically drawn to one another in spite of their differences. It doesn’t help that they each refuse to give up their ingrained biases by playing head games until they are forced by romance and circumstances to join forces. This is a fertile scenario for lots of twists and turns, and there are some good ones, but the waters are definitely muddied by a constantly shifting point of view regarding the exact same scene. Now, I have read stories where a shifting POV works (reasonably well), but never as a refocus of the same scene. As an experiment I give the writer full marks for temerity, but as a reader I found it distracting to the point of frustration. Nonetheless, this is my opinion (as are all my reviews), for I have read others who found it a plus. My rating – three bees. Shifting POV can be so frustrating! I really like to identify with a character and then stick with them.